Sandstone is a beautiful natural floor covering that is popular for its distinctive style. Mimicking the look of beach and desert sand, the golds, reds, browns, and tans of this often multicolored stone can add the perfect decorative touch to a room. At the same time, the fact that it is natural means that its properties are not controlled by a manufacturer, which can cause problems when it is used in certain environments. It's easy to point out the benefits of sandstone flooring, but seeing a nice sandstone tile installation in person says it all. Natural beauty: There is an ineffable quality to natural materials that is obvious in sandstone flooring. Ranging in color from medium tone whites to multicolored maelstroms and all the way back to charcoal and black, sandstone can cover vast stretches of hues, and yet it always has a feeling of earth and rock that can be missing in many of its imitators. Durability: Sandstone can't match as slate or granite for durability, but it is strong enough to last for decades if properly cared for. Uniqueness: Because sandstone is formed from nature itself, the colors, patterns, and hues found in any individual piece are completely unique and different. When sandstone is quarried, it comes out in giant slabs, which are then processed and cut into smaller pieces. That means that every piece of tile in every sandstone floor is one random sample of a great masterpiece of mountainous nature that stretches across the world. Texture: Sandstone, being a rock, comes from the mountain naturally craggy and jagged. In flooring tiles, this is leveled out in a process called “gauging.” This gives you many options with sandstone flooring, as this process can be increased to hone the tiles into smooth surfaces or even polish them flat and glistening. Replaceable: Because sandstone flooring is installed in individual tiles or pieces, the tiles can be removed and replaced with relative ease. You just have to make sure that you save a few tiles from the original installation so that they match the repaired floor. 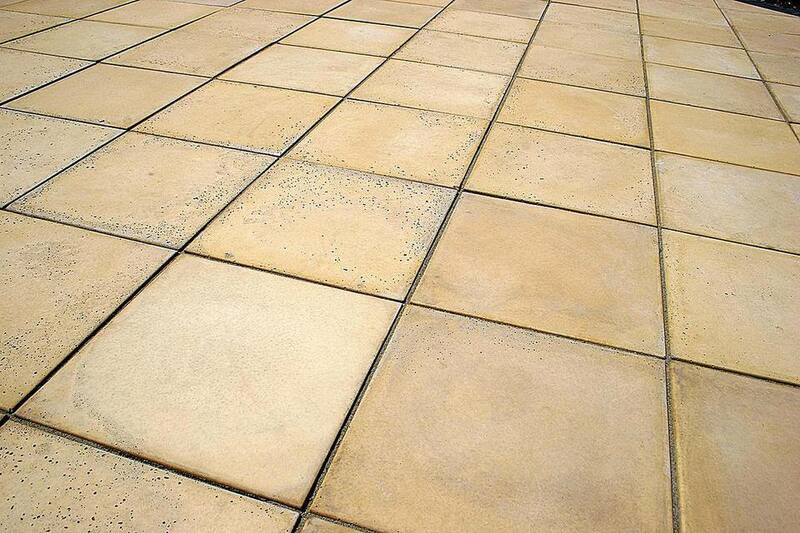 The drawbacks of sandstone should be familiar to anyone considering natural stone flooring. On top of that, sandstone is relatively soft and porous, making it a bit more tricky to use than some other stone flooring materials. Water absorption: Sandstone flooring is known for being a relatively porous material, even among natural stone surface coverings. It can have an absorption rate of between 1 and 6 percent, which leaves it vulnerable to damage from liquid stains, mold, micro-bacteria, and even warping in extreme cases. For this reason, it is generally not used in bathrooms, kitchens, below grade rooms, or exterior locations. Scratches: Sandstone flooring is a rock, but it’s a relatively soft rock. That means that it is subject to scratches and dents over time from claws, high heels, and accidents that send things crashing into the floor. Slippery when wet: There are different finishes that you can get when purchasing sandstone flooring tiles. Honed tile is perfectly flat, and while it has some traction, it can be slippery when it gets wet. If the material is appropriate for polishing, then polished sandstone can be a particularly dangerous slipping hazard, especially in areas where water may be present. Staining: The high absorption rate of sandstone means that colored liquids can penetrate down into the material. If they are not caught early enough, these can cause permanent stains deep into the material. Like other natural stone, sandstone is alkaline and can be damaged by acidic cleaners, although this problem is easy to avoid. Weathering with age: The way a sandstone floor looks when it is installed will not be the way that it will look 10 years down the line, even with perfect maintenance. The material is just too soft, and foot traffic, general wear and tear, and atmospheric exposure will take their toll, causing the different tiles to discolor. However, not everyone considers this a drawback. The personality that a sandstone floor can take on over the years may be considered part of its beauty. In any case, it's important to know how the floor will evolve over time. Should You Install Pre-Finished Hardwood Flooring in Your Home? Are Rubber Floors a Good Idea?